We are indulged in providing the best quality of Paint Booth to our customers. 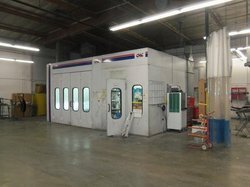 Paint Booth is an engineering excellence providing one of the finest qualities of scratch less, paint finish, and coating over the surface of the objects be it a big furniture item or automobile or its parts and accessories or any other decorative item. Over and above it provides a very hygienic working environment for the Paint Operator who feels very comfortable in happily carrying out his job.